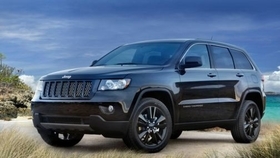 The inquiry affects 146,000 2012 Jeep Grand Cherokee SUVs. WASHINGTON -- U.S. auto safety regulators are investigating the 2012 Jeep Grand Cherokee SUV after complaints about fires inside the car. In a filing Monday, the National Highway Traffic Safety Administration said it has received three reports of fires in the headliner of the SUV near the passenger-side sun visor. The inquiry covers covers 146,000 vehicles. It is not related to a long-running probe of older Grand Cherokees that caught fire when struck from behind. In each of the three complaints that prompted the NHTSA investigation, the driver smelled something burning and saw smoke coming from the headliner. Lowering the windows in an effort to clear the smoke only fanned the flames. The three fires had to be extinguished because they kept burning after the car was turned off. In one case the fire shattered the sunroof, and in another the burning visor fell onto the passenger seat and set the seat on fire. Chrysler Group said the Grand Cherokee remains one of the safest cars on the road. NHTSA typically begins this type of evaluation when consumer complaints or manufacturer service bulletins suggest there may be a safety-related defect. Once that evaluation is complete, the agency either begins an engineering analysis or closes the inquiry. Based on the outcome of the engineering analysis, a vehicle may be recalled or the inquiry may be closed with no further action.